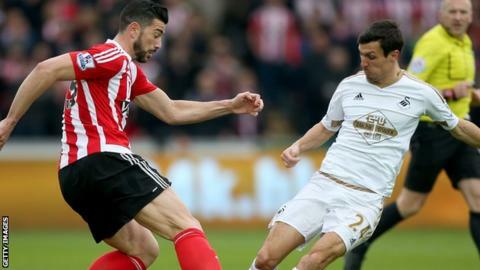 Midfielder Jack Cork says there will be "no pressure" on struggling Swansea when they make successive trips to title-chasing Tottenham and Arsenal. Saturday's 1-0 defeat by Southampton left Swansea 16th, three points above the Premier League relegation zone. They face second-placed Tottenham at White Hart Lane on 28 February and play Arsenal, currently in third, at Emirates Stadium on 5 March. "There is no reason why we can't go there and get something," said Cork. Swansea have never beaten Spurs in the Premier League, but enjoyed a home and away double against the Gunners last season. "Spurs and Arsenal are games where we are not really expected to get anything," Cork told BBC Radio Wales. "You saw at the weekend, Sunderland beat Manchester United. "I know we are down at the bottom, but we can go there and no one is expecting us to win. "We managed to do it twice against Arsenal last year and it would be good to do it against Tottenham because we haven't really managed to get a result against them." Aston Villa are seven points adrift at the bottom of the table, but only five points separates Bournemouth in 15th and Sunderland in 19th with 12 games of the season remaining. "There is no need to panic yet," said Cork. "We play teams around us and I think we will be fine. "But it could go to the wire. A few of the teams down the bottom got good results this week, but we had good form in the previous month."